Read Part 1: Deciding to do the show. Part 2: Preparing to do wholesale. My initial questions. Will there be artists offering original paintings on canvas, or do most artists just offer prints of their work? I wondered if my work would be hidden among the vast sea of ceramics, glass and jewelry as these seemed like the largest categories of work at the show. Answer: Honestly, there were all sorts of artists at this show. Jewelry and glass were popular categories and had many vendors, but there were all sorts of artists represented. Some were very large vendors with a great variety of items, others had only a few items to show. One of my artist friends asked “How big to you have to be to do this type of show?” After seeing some of what folks had to offer, I’d say size isn’t the most important thing. Having an item that the buyer wants, at the right price, is more important. I saw some vendors that offered only one item in slight variations, but they made incredibly beautiful pieces that had market value to the buyers. Is mixed media the best category for me, or should I be in home décor? Answer: For this show, rugs, furniture, wall hangings, lamps, etc seemed to make up home décor. So, I think Mixed-Media was an excellent choice for what I was selling. I loved the ecclentic blend of vendors that were included in the Mixed-Media group. Can’t imagine being placed elsewhere. Do I mainly bring samples of my work and allow buyers to place orders? Do the buyers pay for items at the show? Is there cash-and-carry? Answer: This event was an ‘order-writing’ event. Vendors write orders at the show and the buyers specify a time at which they would like the items shipped. I ended up writing orders from ASAP until September 2010. Some vendors did have a ‘cash and carry” section on their table and others offered to sell their floor samples on the last day of the event. Realistically, what was this going to cost me? Beside the booth fee, what would I need to purchase to setup my booth? Answer: I purchased a 10x10 booth for $1875.00. This space came ‘piped and draped’ which essentially means that there were curtains dividing your space from your neighbor’s space. Electrical was purchased separately. And, since the lighting in the convention center was set on 1/3 power, (i.e., Each third light was illuminated) buying lighting was essential. Hargrove Inc was the Official Service Contractor for the BMAC and provided booth rental options. I didn’t end up using their service. I had tables and displays already available from some of the art/craft shows that I’ve done at outdoor festivals. So, I didn’t purchase their flooring, tables, lights, etc. Although this is likely convenient for vendors traveling from ‘out-of-town’. I’m far from having the perfect booth and many experienced vendors tell me that their booth changes from year to year. (It’s never finished!) But as a first-time exhibitor, I am pretty pleased with how my booth looked. Unfortunately, this is my only booth picture. My other pictures were very blurred. It's not a very good angle to see the entire booth. But, it's the best one I have. When viewed from the other angle, I had a small table with two chairs that allowed me and the buyer to sit down when writing their order. Photographing other vendor's booths was not permitted. You had to have a camera pass, or hire a photographer approved by the Rosen Group. See Part 5 of this series for other booth display photographs. I didn’t want to make a huge financial commitment, as I do not know how often I will attend shows such as this. 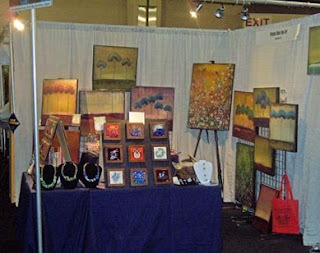 So, my initial purchases were a few display stands that allowed me to hang my paintings (I hung them with s-shaped shower hooks) Initially, I hung these only on the display stands, but they were only 4ft high in a 10 ft. booth and difficult to see over the tables. So, after a recommendation from my mentor (thanks Stacy Simbrom of Angels with Attitude) and my booth neighbor (the amazingly talented Lauren Henry), we displayed a few paintings hanging from the booth’s top rails. I also had paintings displayed on easels (easels from Michael's at $45 ea). Much like how they would look in my studio. I purchased track lighting from Lowes. Approx. $150 w/ bulbs. The recommendation was to have 10 lights for a 10x10 space. I ended up buying 9. I only displayed 6 of the lights and now wish I had included a bit more lighting. Buy lots of zip ties from the hardware store. These were so helpful in hanging the lights and securing the extension cords to the cross bars and the side poles of the booth. Next up: Part 3: Defining terms, writing orders, and other things I needed to know.